The mother of man allegedly murdered by his wife with a drugs overdose has told how she warned him not to marry his partner. The Old Bailey has heard Julian Webb died from an overdose of aspirin and antidepressant. At the time it was thought to be suicide, but an open verdict was recorded at his inquest. 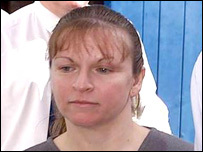 Mr Webb's wife, Dena Thompson, 43, of Larks Rise, Cullompton, Devon, denies murdering him at the house they shared in Yapton, West Sussex, on his 31st birthday in 1994. Mr Webb's mother, Rosemary Webb, said she had been concerned about the whirlwind romance and the fact Mrs Thompson was still married to someone else. Mrs Webb told the court her son met Mrs Thompson in May 1991 and announced they were going to get married three months later. The teacher said she expressed some concern over the speed of the marriage. Jurors also heard how on the night of his birthday in June 1994, Mrs Webb rang to speak to her son but was told by Mrs Thompson he was too ill to come to the phone. She then rang a further three times and asked Mrs Thompson to call him a doctor. At 0500 GMT the following day Mrs Webb was told by police her son was dead. After her son's death she discovered Dena Thompson's divorce had not gone through so her subsequent marriage to Julian was bigamous. Mrs Webb was declared beneficiary of her son's estate after solicitors were informed about the failed divorce. It is alleged by the prosecution that Dena Thompson tricked her husband into taking the drugs in small amounts in the last few days of his life. But Mrs Thompson claimed he was depressed and may have taken his own life.